12 part video series plus 106 pg detailed outline. The course has four major sections: (1) The spiritual requirements for effectual Bible study, (2) tips for daily Bible study, (3) principles of Bible interpretation, and (4) how to use Bible study tools. It also deals with using Bible study software on a computer, a tablet, or a smartphone. 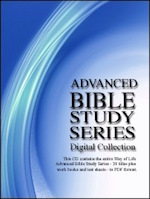 Twenty different titles for advanced Bible study. Based upon the King James Bible and written from a dispensational, Baptist perspective. The Bible Knowledge Test is designed to challenge God’s people as individuals and as churches about their level of Bible knowledge. At the end of the Bible Knowledge Test we give some suggestions for self study. Take the time to examine yourself by the following test. Are you of “full age” or are you yet “a babe”? 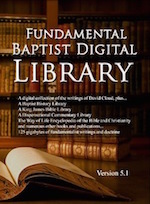 Over 4,100 select books and articles, this roughly 3.2 gigabyte library is the largest fundamentalist research database available. 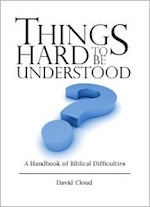 This very practical volume deals with a variety of biblical difficulties. Find the answer to the seeming contradictions in the Bible. Meet the challenge of false teachers who misuse biblical passages to prove their doctrine. 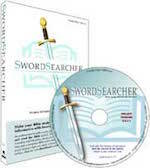 SwordSearcher is our favorite Bible study software. 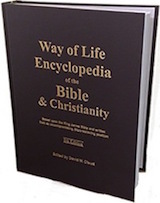 In addition, you can now purchase the Way of Life Encyclopedia and Things Hard to Be Understood together in SwordSearcher format to be included in your searches. Written by a Fundamental Baptist and based on the King James Bible.